I recently read photographer Stephen Shore’s excellent book The Nature of Photographs published by Phaidon Press. The book is based on Shore’s photography classes and is an interesting discussion on the visual language of photography. There are some great photos and many interesting ideas in what is essentially a photography theory, not a how-to book. Although Shore doesn’t talk much about f/stop & shutter speed combinations you will learn how to see and think more like a photographer by reading this book. 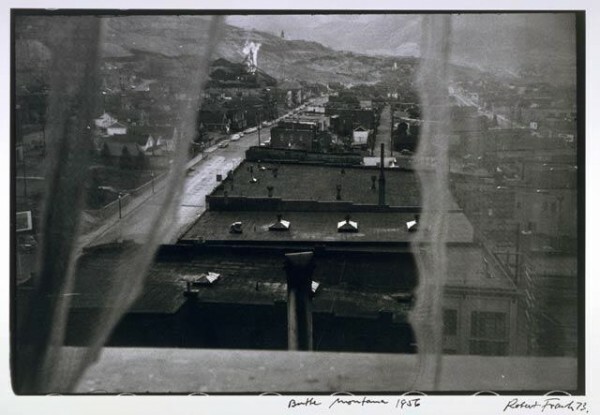 Robert Frank, Butte Montana, Silver Gelatin Print, 1956. It’s an interesting idea to consider. I’ll be posting more thoughts and quotes from Stephen Shore’s book in future blog entries. If you’re interested in reading the book you can purchase it below from my Amazon shop. I get a small percentage which goes towards my coffee fund. Thanks! One Response to What’s The Meaning Of A Photograph?